Dimitra has been involved with the Montessori unit at Berhampore School from the outset when it was first set up by a group of committed parents in 2000. Her two boys both spent their primary years at the unit and Dimitra began teaching here herself in 2005 as the unit underwent a period of rapid expansion. Her curiosity about Montessori education was first sparked after a friend gifted her registration to a Montessori conference in Wellington as a birthday present. There she heard some inspirational speakers who described a method of education where you followed and respected the child and had faith that they could teach themselves. From that point on there was no turning back, and Dimitra became a Montessori enthusiast. She has taught at Athena Montessori College as well as Berhampore Montessori where she is currently head of the unit. For Dimitra, Montessori successfully combines both theory and method, and is a pedagogy that works. Teaching history: Dimitra has been teaching in New Zealand since 1986, having graduated from Victoria University with a teaching diploma and a degree in English Language. She has also worked as an English language teacher while living in Athens in Greece. She holds a 6-12 diploma in Montessori teaching from The Institute for Montessori Education in Christchurch, an AMI 6-12 Diploma from the Montessori Training Centre in New England in the US, has completed three courses for a Master of Education with a Montessori concentration through the University of Hartford in the US, and is a strong mentor for the unit. Interests: Folk dancing, reading, sewing, and hosting dinner parties with vintage china. Desiree first heard about Montessori education when she was looking at options for her own children, and was drawn to the calm, focused nature of the Montessori classroom and its philosophy of following the development of the child. She knew this was the right choice for her two girls and began looking more deeply into the Montessori approach and found it aligned with her belief in child-led education, which had been sparked earlier in her teaching career when looking at different approaches to enquiry-based learning. Her interest in finding out more about the Montessori method meant she attended Montessori parent education evenings at Berhampore School and developed a good rapport with the teaching staff. When a teaching position at the unit came up in 2017, Desiree was a strong contender, and as a life-long learner she has embraced the opportunity to further her Montessori knowledge and training. 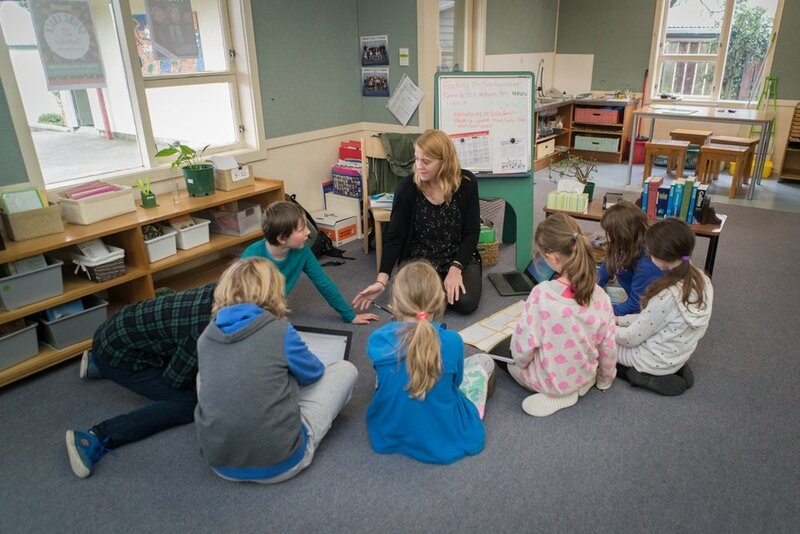 Teaching history: Desiree has been a teacher since 2003, working in Christchurch, England, and now Wellington. She has a Bachelor of Arts in Psychology and Sociology from the University of Canterbury, and a Teaching Diploma from the Graduate School of Education. Her first foray into teaching was as a ballet teacher while at University. She holds a Montessori Teaching Diploma for Upper Elementary children (9-12) from the North American Montessori Center in Canada. Interests: Iyengar yoga, long walks listening to stimulating podcasts, spending time with friends and family. Helena has a long history at Berhampore School, first starting as a whanau helper at the school’s Māori unit Te Rito Harakeke which led to a role supporting children with special needs. Helena came across the Montessori method while researching autism to support a child she was looking after, and she made a beeline to the school’s Montessori unit to find out more about it. Her curiosity awakened, she began attending parent education evenings, did more research, and found the method of teaching resonated with her. She jumped at the chance to help support a Montessori child with autism transition from preschool, and after supporting that child through his Montessori primary schooling at Berhampore, undertook Montessori assistant training in 2017 with the help of PPMET and is now a classroom assistant at the unit. Helena feels Montessori education fits naturally with her Māori values, citing the strong sense of community and belonging; Manaakitanga seen through sharing, grace and courtesy; the sense of Whakapapa or Cosmic Education through great stories; Tuakana Teina with younger people learning from older; and the importance given to the Mana, or the potential inside each child with a focus on the whole child. Hails from: Wairoa and is affiliated with Kihitu Marae and of Ngati Kahunungu iwi. Montessori training: AMI Elementary Assistants Course, Maria Montessori Education Foundation, Auckland. Interests: Helena enjoy being with her family and learning more about Te Ao Māori and has enjoyed marching and soccer.